Dreamcatchers Photography was the first business we started, and one of the most influential businesses in terms of solidifying our thoughts on what we want our businesses to be. We founded Dreamcatchers Photography in 1996. I came from a photography and film background and Angela of course from an art background. After our own wedding in 1994 and a bad experience with our photographer, we decided we could do the wedding photography thing better than most, but in our own style, with no compromises. That style was 35mm black and white photojournalism. There were no options or add-ons with our package. No posed shots except one (the couple right after the ceremony, before the family mobbed them). No color photos. No assembling small groups and asking them to smile. No discounts based on how small the wedding was, for we were there all day. We would arrive early in the morning and be flies on the wall, taking pictures of the preparation. We would stay late and photograph the dance. We would bring art into the wedding photography, while at the same time being unseen and unheard. We were wedding photo art ninjas! At the time, there was nobody else doing it like this. Nobody. 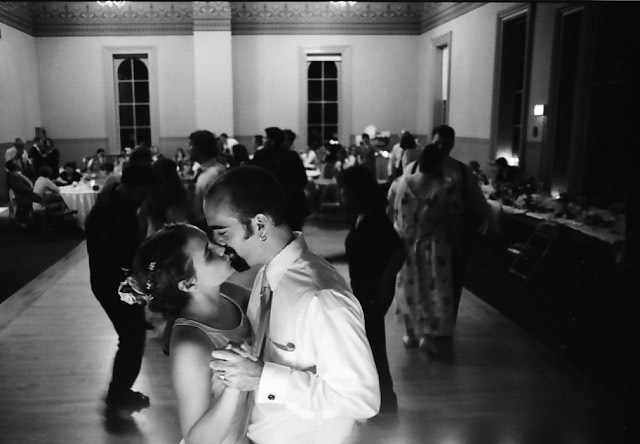 Photo from our first wedding we photographed, our soon to be good friends Sara and Tony, married in at the Stillwater courthouse August of 1997. Were we for everybody? Definitely not. We turned away business time and time again because we only wanted to work with people that understood our vision, no offense to the others. When a couple inquired about our services, we interviewed them to make sure it was a good fit. We said no, often. We kept a file of photographers to suggest to people who wanted (or the family insisted on) more posed shots, flashbulbs going off, arrangements of multi-generational poses, etc. So who who were our clients for Dreamcatchers Photography? Very interesting people who wanted something different when it came to their wedding photography. Independent thinkers that appreciated the spontaneous and the random, rather than wanting a perfectly planned and carefully executed day. People who realized what happens naturally is far more interesting than what happens because of a script. It was a great business that helped supplement our daytime income quite well. We kept the business going until the early 2000's, when digital photography started to emerge and that's what everybody asked for ... film was sooooo yesterday. The cost of new equipment considering the quality it delivered was crazy (the first Nikon digital SLR's were in the 1.2 megabyte range and cost nearly $10,000 ... you are carrying a camera a hundred times better in your pocket right now), and truth be told we were burnt out on long days of stressful work.